Chen Kun (陈坤) will be making an explosive, much awaited comeback to television next year, as he has been confirmed to play the main lead in the upcoming Chinese epic drama, The Rise of Phoenixes <凰权·弈天下>. He is the only confirmed actor in the cast thus far. Principal photography will begin next April. The 40-year-old actor will also be starring in the spy drama The Escapist <脱身者>, which was announced last week. Chen Kun’s last television drama appearance was in 2008 for Remembrance of Dreams Past <故夢>. The Rise of Phoenixes is set in an alternate world, where ancient China is ruled by the Tiansheng dynasty. Chen Kun portrays Ning Yi, the sixth prince, who hides his calculating personality behind a facade of playfulness. Meanwhile, he meets Feng Zhiwei, a court official who is in fact a woman. Feng Zhiwei was the illegitimate daughter of a noble clan, who got banished from her family after being wrongfully accused of a crime. She soon discovers that she is the only surviving royalty of a fallen dynasty, and seeks vengeance, even if she has to betray her loved ones. The drama is adapted from the 2012 best-selling novel of the same name by Tianxia Guiyuan (天下归元), who also pens the script. 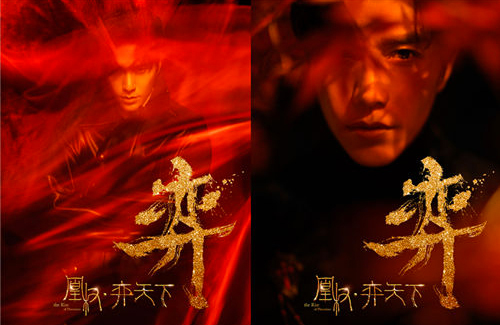 Earlier this week, the studios of The Rise of Phoenixes released character concept posters of Chen Kun on social media, showcasing his character’s canny and calculative persona behind a veil of red. The posters were shot by fashion photographer Chen Man (陈漫). According to official reports, The Rise of Phoenixes had been in the making for two years. The drama is co-produced by Croton Media and China Syndication. Sounds good and glad he’s back doing series. But this project will depend largely on the casting of the female lead. I can only hope it won’t be one of the overexposed young actresses of the past few years. That’s great! Finally I get some a break from ‘fresh meat’ actors in Chinese drama. Chen Kun is always a joy to watch, but we have to wait til next April for filming to start? That is a downer.